How many times do artists need to tell their peers and hopeful clients that commissioned work isn't "drawing lang naman" and requires real payment? 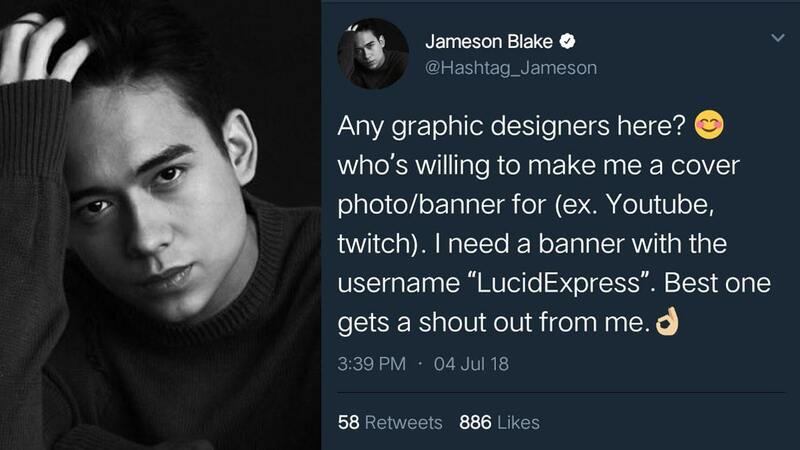 Actor and Hashtag member Jameson Blake must've thought that there was nothing wrong in asking the graphic designers among his 340 thousand Twitter followers to make him a banner with the username, "LucidExpress," in exchange for a (freaking) "shout-out." You read that right. He wrote: "Best one gets a shout-out from me." It looked like Blake realized his mistake and has since taken down the original post (but not before a concerned netizen was quick enough to take screenshots). Or maybe not. Someone actually did him the favor, and she ended up getting cyberbullied for the innocent gesture. As for Blake, after saying, "I appreciate the artwork," he's nowhere to be found—not a single tweet defending the artist. Graphic designers online called out the young actor for his "belittling" request and being "cheap," with some even resorting to memes. Others got creative instead and tagged Blake in their own "LucidExpress" entries, with the hashtag, "Value Filipino Artists."